During the period 2003 through 2010, the Green Infrastructure Partnership (also known by the acronym “GIP”) played a prominent role in leading change and assisting with implementation of the Water Sustainability Action Plan for British Columbia, primarily in the Metro Vancouver region. After incorporation of the Partnership for Water Sustainability in BC as a not-for-profit society in 2010, the responsibilities of the GIP were assumed by the Partnership for Water Sustainability. The last GIP Chair, namely Ray Fung, has carried on as a member of the Partnership’s Leadership Team. 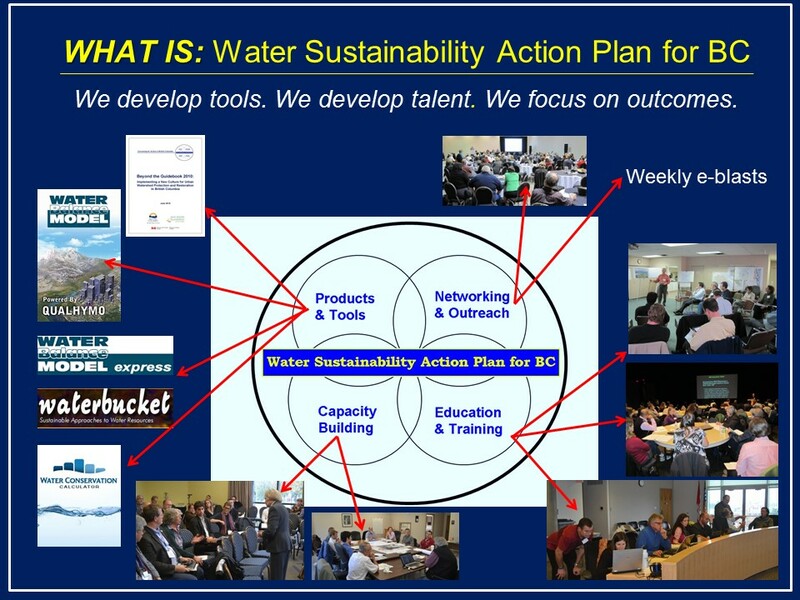 Throughout 2014, the Partnership is celebrating 10 years of successful Water Sustainability Action Plan program delivery. The celebration includes a series of flashback stories featuring those who have played leadership roles in delivering elements of the Action Plan. One of those champions is Paul Ham who was GIP Chair from 2005 through 2008. The reflections of Paul Ham are introduced below. The Partnership for Water Sustainability has honoured Paul Ham by naming him a Lifetime Member of the Partnership. To read the complete story about the reflections of Paul Ham, and learn more, click on Celebrating a Decade of Success. Paul Ham was with the City of Surrey for over 30 years, where he had a distinguished career and rose to City Engineer. 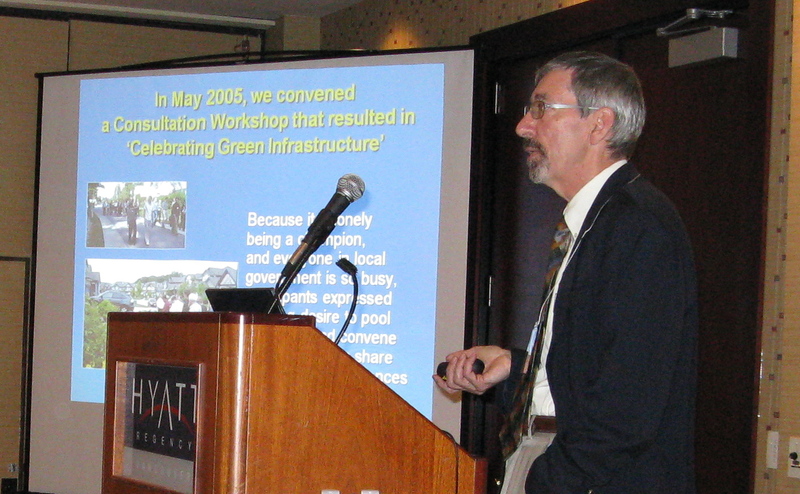 In 2005, he succeeded Chuck Gale as Chair of the Green Infrastructure Partnership. He served as Chair until 2008 when he retired from the City. He continued as Past-Chair until 2010. Under his leadership, initiatives undertaken by the Green Infrastructure Partnership enhanced the credibility of the Water Sustainability Action Plan for British Columbia. “With the perspective of time it becomes increasingly apparent the extent to which Paul in his own quiet and unassuming way provided a leadership role in making things happen,” reflects Kim Stephens, Executive Director with the Partnership for Water Sustainability. “The opportunity to present to the Sustainable Region Initiative Committee of the GVRD Board was a huge opportunity,” stated Pamela Goldsmith-Jones in December 2006 at a Sustainability Community Breakfast when the GIP team spoke to this theme: Changing the Way We Develop Land: Design with Nature. Pamela Goldsmith-Jones was Mayor of West Vancouver from 2005 through 2011. At the rollout of “Beyond the Guidebook” in November 2007, Paul Ham explained the strategic importance of the Showcasing Green Infrastructure Innovation Series as a catalyst for implementing changes in practice that reflect a ‘design with nature’ philosophy. 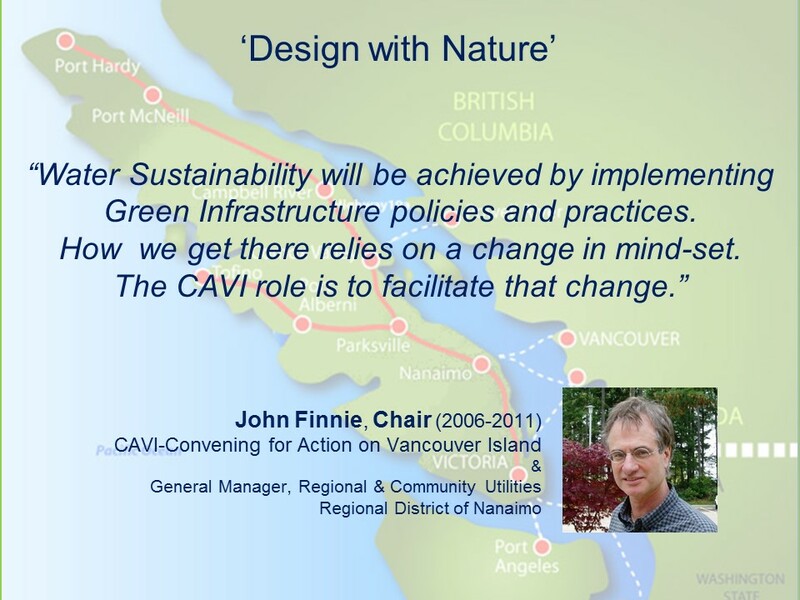 “Shortly after becoming GIP Chair, I met with my peers on the Metro Vancouver Regional Engineers Advisory Committee (REAC), and asked them to support and participate in a Green Infrastructure Consultation Workshop that the City of Surrey would host in May 2005 on behalf of the GIP. This proved to be a transformational event. The majority of Metro Vancouver municipalities participated. The ‘Convening for Action’ initiative was well and truly launched,” recalls Paul Ham. “This success helped to lay a strong foundation for incorporation of the Partnership for Water Sustainability in BC. This entity is now the hub for a ‘convening for action’ network in the local government setting, and the keeper of the GIP legacy,” concludes Paul Ham. To read the complete story posted on the Convening for Action community-of-interest, click on Celebrating a Decade of Success: “Green infrastructure practices have moved from pilot project to neighbourhood and watershed scale approaches,” reflects Paul Ham, an early green infrastructure champion.